Digital Information will be unveiling improvements to its existing InkZone ink key preset and closed loop solutions, the DJet, and SpectroPocket for Android at Drupa 2016 in Hall 8B, Stand C07. They are also pleased to announce that the world premiere of the all new Heidelberg Phoenix, an imaging system for screen, flexographic, letterpress, and offset printing will take place in their booth during the show. 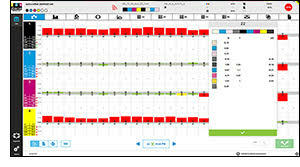 Digital Information celebrates more than 3000 offset press connections worldwide of InkZone, their internationally renown, JDF-based preset and closed-loop color control system wth the launch of InkZone 8. InkZone 8 features a newly developed user interface, full compatibility with Windows 10, document-oriented database, and wet-dry measurements in cooperation with all known color scanning instruments. For older versions of InkZone, an inexpensive update is available. Also in the booth, the Djet is a digital front/back printing system up to 43 inches wide (1076 millimeters). The system operates from roll to cut sheet and is suitable for impositon proof printing and small print runs in paper formats up to B0. At Drupa this year, Digital Information will be demonstrating the Djet with the latest generation of printers from Epson. The Djet can also be seen at the Epson booth in Hall 5, Stand A01-1. InkZone Version 8 with newly developed user interface. One of the DJet’s strongest advantages is the high registration precision between recto and verso. Output precision of the latest model is assured by a patented control system using a high-definition video camera integrated into both printers. Speed is another strong point of the DJet. Beyond the original scope of operational purpose for the DJet – double-sided proof printing – the DJet has become more and more a productive system for short run printing. Rounding out Digital Information’s solutions at Drupa 2016, the SpectroPocket for Android is the world’s first smart phone system for measuring individual color patches on a wide variety of substrates. SpectroPocket works with commercially available spectrophotometers. The measurement data can be displayed on mobile Android devices such as smartphones or tablets as spectral reflectance values, graphs, LAB, XYZ and RGB values, as well as densities. 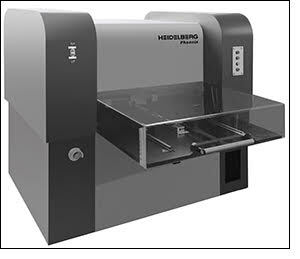 The Heidelberg Phoenix, a multi-purpose LED-UV-Imaging system. Also happening in the Digital Information booth at Drupa 2016, the Heidelberg Phoenix will be introduced for the first time. The Phoenix enables imaging of printing forms in screen and flexo printing, exposure of letterpress and offset printing plates, as well as plates for pad printing. The Phoenix uses LED UV technology incorporating two wavelengths (380 and 405 nanometers) allowing imaging to the respective emulsion surface and depth curing. The exposure head can be moved in X, Z and Y directions. This allows to image different levels of screen frames. The Phoenix is built in two sizes: Up to 600 x 800 mm and 800 x 1000 mm. To learn more about the enhanced InkZone solution, as well as the DJet, SpectroPocket, the Heidelberg Phoenix and other exciting developments, please visit Digital Information at Drupa 2016 in Stand C07 in the new hall 8B. 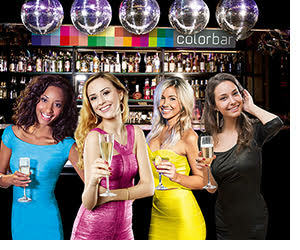 Enjoy the relaxed atmosphere of the legendary Colorbar, which is run in partnership with Tecco. Visit Digital Information at the Drupa trade show in Dusseldorf, Germany from May 30 to June 10, 2016.